The St. Louis Browns had been members of the American League since 1902, but it took a World War for them to finally reach the World Series. Heightening the drama were their opponents (and tenants in Sportsman's Park), the St. Louis Cardinals.The Browns won their first-ever World Series game, taking the opener 2-1, thanks to George McQuinn's two-run homer in the fourth and nine strong innings from Denny Galehouse. The Cards came back to even the Fall Classic in Game 2, but it wasn't easy. They led 2-0 after six frames, only to see the Brownies tie the contest in the seventh. 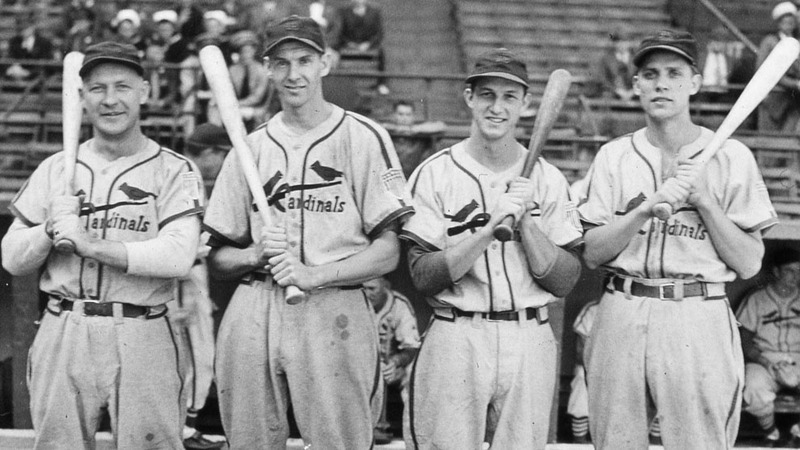 It was still 2-2 in the bottom of the 10th, until Cardinals pinch-hitter Ken O'Dea singled to right field, scoring Ray Sanders with the game-winning run. The American Leaguers struck back in Game 3, as Jack Kramer went nine innings and allowed just two (unearned) runs to capture a 6-2 victory. First baseman George McQuinn paced the hitters with three hits and two RBIs.That Brownie glory was short-lived, however, as the Cardinal pitchers hogged the credit in Games 4 and 5. In Game 4 it was Harry "the Cat" Brecheen, who tossed a complete-game nine-hitter to earn a 5-1 victory. In Game 5. it was Mort Cooper, who trumped Brecheen with a seven-hit shutout and struck out the side in the bottom of the ninth. Brownies starter Galehouse, so good in Game 1, pitched well himself but wound up on the short end of a 2-0 stick against Cooper. In Game 6, the Cardinals went up 3-1 in the fourth frame with three runs, only one of them earned after Browns shortstop Vern Stephens botched a throw. The scoring ended there, and Redbird right-hander Ted Wilks closed out the Series with 3 1/3 innings of perfect relief work.